NYC is experiencing some ridiculous heat waves this summer. Normally, everyone would be happy that the sun is shining and it’s warm enough to wear shorts and take a walk, BUT these days are topping out at 99, 101, 103 degrees… which makes me just want to stay inside and take advantage of the air conditioning and ALL the fans I own. And because I wanted a snack/dessert but couldn’t bear to walk to the fro-yo place so I used all the frozen fruit I had been hoarding away. 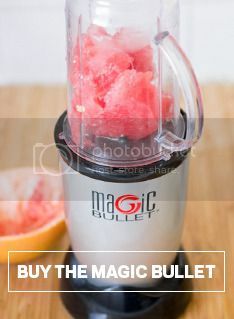 Throw everything into your Magic Bullet and give it a whirl. Then have MOO cow (or other cutesy inanimate object) inspect it thoroughly. Then you can smugly sip your cool cool sMOOthie while the world outside your window melts. This is one fantastic recipe by Livestrong.com‘s Jennifer Cassetta, a clinical nutritionist and personal trainer. It transports her back to the island of Kauai, she writes, packed with the healthy and decadent flavors of coconut and pineapple. It’s also perfect for breakfast – giving you the energy you need to face the day, while balancing out your blood sugars, preventing spikes and valleys in your energy level, as well. Click here for her full article! Combine ingredients in your Magic Bullet and blend until you reach your desired consistency. Add 1/2 cup coconut milk for a creamier smoothie. I love making smoothies during the hot summer months. It usually doesn’t get too hot in the city, but lately it’s been really warm! I’ve been making smoothies every day, for breakfast or lunch, to cool me down. I love experimenting with different fruits and vegetables. I love the combination of strawberry and kiwi flavors in the strawberry kiwi smoothie. You can use fresh or frozen strawberries. Here is a tip to peel a kiwi: slice off each end, then use a small spoon to get underneath the skin and work your way around. Then just slice the kiwi out – it is as simple as that! Working out? Need energy? Looking to beautify? Well, this list of smoothie recipes might be just what you need. With a smoothie for just about anything you can imagine, it’s basically got you covered. Enjoy! So, I’ve told you about this before. Kind of. But before you go getting all, “Ugh, are you running out of ideas or what, Erin? !” just, give me a minute. Because you see, the first time I made this, it was kind of by accident and I kind of forgot about it afterwards. And I just, I don’t want you to make the same mistake. So, we’ve been drinking this, uh, pretty much everyday. We ran a half marathon recently and, I swear to you, these smoothies saved me the whole time we were training. They are packed with protein, they’re sweet and peanut buttery and ugh. So good. Just, make one. Trust. milk as needed (I start with about 1/4 cup and add more if it looks too thick. Also, um, this is what happens when you try to take pictures of yourself with your camera on self timer on a windy day because you’re home alone. It happens. You should already be salivating. This recipe by the awesome Edgy Veg combines the sweet cake-batter flavors of strawberry shortcake with the healthful benefits of high-protein ingredients to make a smoothie reminiscent of a classic dessert. Add all ingredients to your Magic Bullet and blend until smooth. This is my favorite green smoothie recipe. I know, I know… It doesn’t look very appealing. Instead of a pretty pink or purple color, it’s green! When I brought one to my husband the very first time I made one for him, his reaction was priceless. He had the most disgusted look on his face and exclaimed, “What is that? !” After some convincing, he decided to give it a try. “MMMMM,” he said. I must admit, green smoothies can be pretty scary. I have also had my fair share of green smoothies that tasted horrible. SOMEONE decided to sign up for a triathlon happening in a few months… No, not me, actually! It was my husband. I decided to sit this one out and cheer him on. I am, however, training with him. That counts for something, right? We’ve been really good so far, but it’s still early. This morning we woke up at 6 am to go swimming before the work day started and it wasn’t as bad as I thought it would be! If only I could maintain this routine of working out early in the morning. It’s easier this time of year, too, because the days are longer. I just love how much natural light we have this time of year. Our workouts have been alternating between running, biking, swimming, and home weight training (this is actually the worse one for me – oucchh!) I find that the more I workout, the more my body craves it. I have actually been feeling bad if I don’t workout for more than 2 days. Along with the training, I have been thinking of post-workout meals and drinks. My new favorite right now is this peanut butter banana shake, which tastes like a yummy milkshake, so even though it’s packed with protein, it’s almost like having dessert after working out! Peanut butter and bananas are such a match made in heaven, don’t you think? Once you’ve made this tropical green smoothie, I want you to sit down, close your eyes and picture yourself on a beach during a warm, sunny day. Think about blue skies and a cool ocean breeze, with absolutely no sound except for the waves crashing down on the beach… Feel relaxed?? Good! This tropical green smoothie not only has incredible health benefits, it has the power to take you away from the stress of everyday life! OK, well maybe just for a little while. Go ahead and blend up this super healthy smoothie and take a few minutes to imagine yourself somewhere tropical. You deserve it and your body with thank you for it! Add all ingredients in a large Magic Bullet cup or pitcher (only add 2 tsp shredded coconut, and reserve the other half for topping later). Add 1 tsp of shredded coconut on top of each smoothie. Tropical Sunshine Smoothie for Summer! The sun is here, the sun is here! I have never appreciated the sun as much as I do in NY, because in the winter it’s gone FOREVER. When I was in CA, I took that nice warm sunshine for granted, but now I’ll make amends by making this fun Tropical Sunshine Smoothie from Edible Perspective. 1. Place the mango, banana, pineapple, juice and milk into your Magic Bullet. 2. Then blend until well combined. 3. Pour into a chilled glass and top with coconut flakes. Stick in a straw and enjoy your sunshine in a cup!